1981-06-04. New. Ships with Tracking Number! INTERNATIONAL WORLDWIDE Shipping available. Buy with confidence, excellent customer service! 1999-04-04. New. Ships with Tracking Number! INTERNATIONAL WORLDWIDE Shipping available. Buy with confidence, excellent customer service! 1991-01-01. Good. Ships with Tracking Number! INTERNATIONAL WORLDWIDE Shipping available. May not contain Access Codes or Supplements. May be ex-library. Shipping & Handling by region. Buy with confidence, excellent customer service! 1982-04-12. Good. Ships with Tracking Number! INTERNATIONAL WORLDWIDE Shipping available. May not contain Access Codes or Supplements. May be ex-library. Shipping & Handling by region. Buy with confidence, excellent customer service! Knopf, 1981-06-12. First. Hardcover. Used:Good. Knopf. Hardcover. 0394411455 New Condition. . New. University of California Press. PAPERBACK. 0520224647 New Condition. . New. University of California Press. PAPERBACK. 0520224647 Special order direct from the distributor . New. Hardback. New. 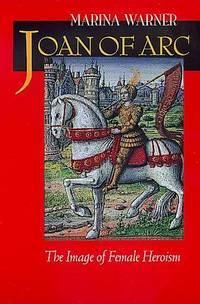 The fame of Joan of Arc began in her lifetime and, though it has dipped a little now and then, she has never vanished from view. Her image acts as a seismograph for the shifts and settlings of personal and political ideals: Joan of Arc is the heroine every movement has wanted as their figurehead. Hardback. New. A fascinating study of the symbolism of Joan of Arc in her own time and ever since in literature, politics, on the stage, and on screen. 1981-06-04. Good. Ships with Tracking Number! INTERNATIONAL WORLDWIDE Shipping available. May not contain Access Codes or Supplements. May be ex-library. Shipping & Handling by region. Buy with confidence, excellent customer service! 1999-04-04. Good. Ships with Tracking Number! INTERNATIONAL WORLDWIDE Shipping available. May not contain Access Codes or Supplements. May be ex-library. Shipping & Handling by region. Buy with confidence, excellent customer service! University of California Press. PAPERBACK. 0520224647 Like New Condition. . Fine. Knopf. Hardcover. 0394411455 Like New Condition. . Fine. Oxford UP. PAPERBACK. 0198718799 Brand New, printed in english , Ready to ship, fast delivery (6-8 busienss days ) worldwide . New. Knopf, 1981-06-12. First Edition. Hardcover. Very Good/Good+ Dust Jacket. 1st printing of 1st American edition, as stated and with no other printings listed. Very good hardcover in good+ dust jacket. Binding is tight, sturdy, and square; boards and text also very good+. Unclipped DJ has general wear, with the worst being along the top edge and including a couple small tears. DJ now protected in Mylar wraps. Ships from Dinkytown in Minneapolis, Minnesota. London, England: Penguin Group, 2000. Softcover, reprint, 320gms, 296 pages. Carol Ann Lee has been allowed access to a number of previously unpublished documents and gives a definitive account of Anne Frank's short life before, during and after her diary. Book is in good condition with minor general wear and tear and moderate page discolouration throughout, otherwise no other pre-loved markings.. Reprint. Softcover. Good/Not Applicable. 8vo - over 7¾" - 9¾" tall. California - Univ. Press of. Paperback. VG . Weidenfeld and Nicolson 1981. Super octavo hardcover (VG) in d/w (VG); all our specials have minimal description to keep listing them viable. They are at least reading copies, complete and in reasonable condition, but usually secondhand; frequently they are superior examples. Ordering more than one book will reduce your overall postage costs. University of California Press, 1999-11-04. Paperback. Used:Good. Univ of California Pr, 1999. Trade Paperback. Fine. University of California Press, 1999. Trade Paperback. Very Good. University of California. Paperback. 0520224647 . Brand new book ~No marks . New York: Knopf, 1981 349pp. Top edge has light dust staining. Spine is slightly cocked. Tips and spine ends are bumped lightly rubbed. Spine panel has light spotting. Edges have light creases. Lower edge of rear panel has a tiny tear. Top edge is sunned. Toning to the inside of the jacket at the top edge, spine panels and flap folds. Text is unmarked. 0394411455. First US Edition. Hardcover. Very Good Minus/Good Plus Jacket. Penguin Books Ltd, 1983. Soft cover. Good. New York: Knopf. Very Good with no dust jacket. 1981. Hardcover. The Image of Female Heroism, 1st Am. Edition, Brown covers w/ gilt lettering, bibliographical notes. .
New York, NY, U.S.A.: Alfred A. Knopf, 1981. Book. Very Good. Hardcover. First Edition. Lightly worn. First American edition. Univ of California Pr, 1999. Book. As New. Trade Paperback. 8vo - over 7¾" - 9¾" tall. NEW book. NO remainder marks or clippings. Tight spine, clean pages. Illustrated. NO writing, marks or tears. 351 pages. Joan has a unique role in Western imagination--she is one of the few true female heroes. Marina Warner uses her superb historical and literary skills to move beyond conventional biography and to capture the essence of Joan of Arc, both as she lived in her own time and as she has "grown" in the human imagination over the five centuries since her death. She has examined the court documents from Joan of Arc's 1431 Inquisition trial for heresy and woven the facts together with an analysis of the histories, biographies, plays, and paintings and sculptures that have appeared over time to honor this heroine and symbol of France's nationhood. Warner shows how the few facts that are known about the woman Joan have been shaped to suit the aims of those who have chosen her as their hero. The book places Joan in the context of the mythology of the female hero and takes note of her historical antecedents, both pagan and Christian and the role she has played up to the present as the embodiment of an ideal, whether as Amazon, saint, child of nature, or personification of virtue..
(Weidenfeld & Nicholson, rpt., 1983). Paperback. Covers creased, corners of rear pages browned and waterstained, otherwise a good working copy. 346pp. Knopf. 1st printing America,1981. Very Good/Very Good hard cover. 8vo,boards,349pp,illus. edgewear,yellowing,small tears,scratches,crease front flap,dust jacket. light shelfwear,slight flare,covers. edges yellowing,clean,tight,text. religion. VINTAGE, 1991-01-01. New Ed. Paperback. Good. University of California Press, 1999-11-04. Paperback. Good. Knopf. Used - Good. Ships from Reno, NV. Former Library book. Shows some signs of wear, and may have some markings on the inside. 100% Money Back Guarantee. Shipped to over one million happy customers. Your purchase benefits world literacy! Knopf. Used - Good. Shows some signs of wear, and may have some markings on the inside. University of California Press, 2000. 1st Edition 1st Printing. Soft cover. As New. 8vo - over 7¾ - 9¾" tall. As New condition, no DJ. First edition, first printing. No markings to the text block. No marks of personal identification or prior ownership. Berkeley and Los Angeles: University of California Press, 2000. Book. Near Fine. Soft cover. 1st Edition thus. 38020 shelf. Unread. Trade paperback, pictorial red covers. No names, clean text. With b/w photos, repros. Index. .
New York: Random House/ Vintage, 1982. Book. Very Good+. Soft cover. 1st Edition thus. Trade paperback, pictorial blue covers, faint spine creases. No names, clean text. Index. With section of color plates. Alden Whitman blurb. Solid. 2900 shelf. Berkeley, Ca, U. S. A.: University of California Press. Fine. 1999. softcover. wonderful title; Always Delivery Confirmation. 35 Years Fast Excellent Service. We Know How To Pack Books. .
London: Weidenfeld and Nicolson, 1981. 1st Edition 1st Printing. Hardback. Very Good/Very Good. 8vo - over 7¾ - 9¾" tall. First edition, first printing. Octavo hardback. xxvi + 354 pp. Illustrated + maps Very Good condition in very good unclipped dust jacket. No inscriptions. Slight foxing on page edges. Knopf Doubleday Publishing Group, 1981. Hardcover. Good. Disclaimer:A copy that has been read, but remains in clean condition. All pages are intact, and the cover is intact. The spine may show signs of wear. Pages can include limited notes and highlighting, and the copy can include previous owner inscriptions. An ex-library book and may have standard library stamps and/or stickers. At ThriftBooks, our motto is: Read More, Spend Less.Dust jacket quality is not guaranteed. University of California 2000. Super Octavo softcover (VG+); all our specials have minimal description to keep listing them viable. They are at least reading copies, complete and in reasonable condition, but usually secondhand; frequently they are superior examples. Ordering more than one book will reduce your overall postage costs.